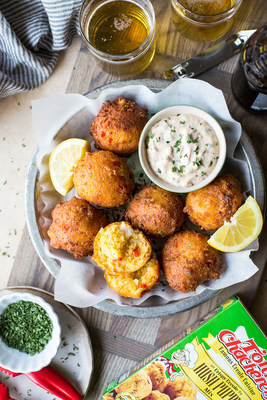 OPELOUSAS, La., April 4, 2019 /PRNewswire/ -- Crispy on the outside, tender on the inside … Lobster Hush Puppies with Creole Remoulade are perfect for your next fish fry! Thanks to Tony Chachere's®, Mary Ann Dwyer of The Beach House Kitchen, says this Louisiana-style meal takes only 30 minutes and is a winning dinner for your family. Place steamer basket into large pot filled with 2 inches of cold water. Cover and bring to boil. Once boiling, add lobster tails to the basket. Cover and cook for 5-6 minutes. Remove tails from the pot. They should be completely cooked in the center of the meat. Once cooled, remove the meat and finely chop. Set aside. In a large bowl, combine Tony Chachere's Crispy Creole Hush Puppy Mix, milk and egg. Gently fold in cooled lobster meat, red pepper, green onions, lemon zest and Gruyere cheese. Do not overmix. Line large baking sheet with parchment paper. Place wire rack on top. Heat several inches of canola oil in large Dutch oven to 350°F. Add enough oil so hush puppies are completely submerged. Using a 1 ½-inch cookie scoop, drop batter into hot oil. Do not crowd the pot. Fry until hush puppies are a golden brown, about 4 minutes. Remove to prepared sheet. Serve immediately with chilled Creole remoulade. Tony Chachere's® Famous Creole Cuisinewas founded in 1972 by Tony Chachere, the "Ole Master" of Creole cooking. Tony Chachere's® continues to be family owned-and-operated and is located in Opelousas, Louisiana. You can get more Tony Chachere's® recipes and products by visiting tonychachere.com/Recipes. For all of the cooking tips you need, go to tonychachere.com/Video.